And then you have the opposite of colorful green stones – you look to neutrals. 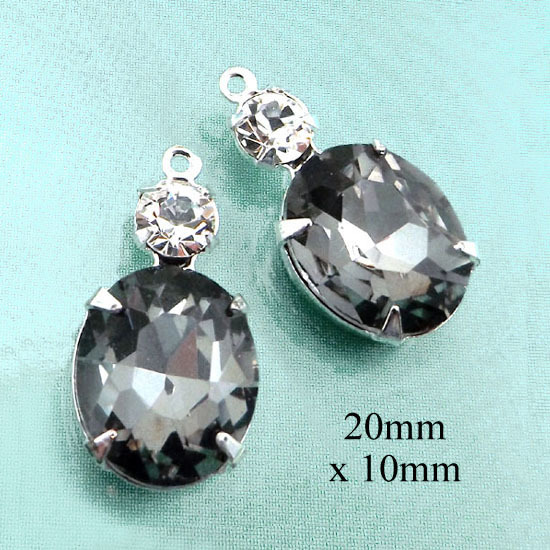 They go with everything, they look very classy, and right now you can get your black diamond (deep grey-black) glass jewels with a great “buy one get one free” sale! Buy any black diamond jewels from my shop from April 30, 2018 to midnight May 3, 2018 – and you get a second pendant or pair of jewels free (equal or lesser value). So you can make that wonderful pair of earrings for your Mother’s day gift (yes there’s still time) – and make a second pair for yourself! Just a quick note that green jewelry can be very spring-like! The pic here shows a few of the green glass jewel styles I have in my shop right now. So fresh and pretty! And isn’t it interesting, the different shades that are part of the “green” color family. Imagine these with purple – with royal blue – with cream or white – with pink! Meanwhile, just a little inducement for DIY goodness: Buy any pair of green glass jewels in my shop and from April 28, 2018 through May 1, 2018 (at midnight) you get an extra pair for free! You can pick any pair for your freebie (equal or lesser value is the only limitation). So have fun – and go green! I am so in the mood for this dress! It’s a gorgeous vintage sundress. The fabric is polyester, which means yes it’ll be hot on 100 degree days – but the rest of the time (i.e., almost always) it’ll be washable and it won’t wrinkle and it’ll always look good. These things are important! Is that not adorable? And look at the fun details! The spaghetti straps, the little keyhole neckline, the bias cut fabric (you know that moves beautifully!) And not to mention it’s super affordable. It’s available from Power of Three Vintage on Etsy. This is the kind of vintage shopping that’s fun! The shop is a joint operation with three sisters, and they have got a great eye for unique clothing – all featuring black, which is kind of a cool niche – and I think they’re going to be around for a while. Go shopping – you’ll thank me! Restocking black diamond glass beads – and they’re a great Gift for Mom! These are actually one of my favorite “duo” jewel combinations. They aren’t “summery”, they aren’t just for winter – they are classic and year round and did I mention, they go with practically every color? Very useful when you just need to grab some earrings, put them on, and head out the door. And when you want something that’ll go with blue jeans or LBD. And just in case you’re looking for that perfect gift for mom, that you can afford, that she’ll love? Problem solved: these will totally work! So here’s the deal. 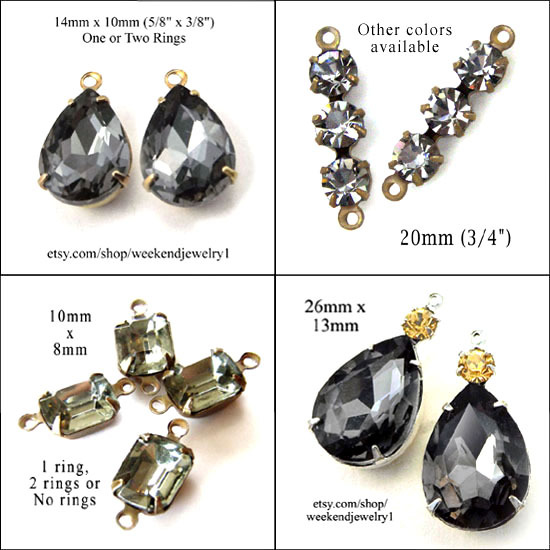 Buy either of these jewel styles, and you get a second pair of jewels free – equal or lesser value and all that. 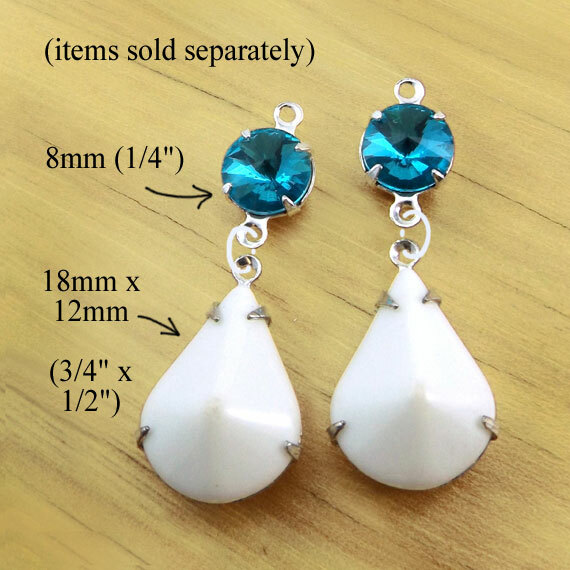 In practice, it means that if you buy the white teardrops, you can get the aqua glass connectors for free! 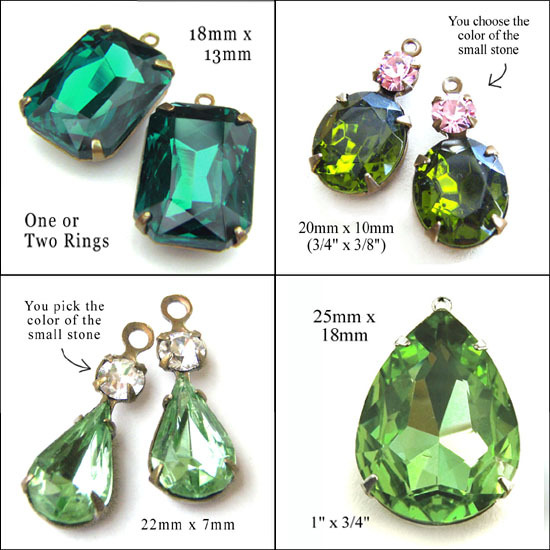 Or choose another color – take a look around my shop and I bet you’ll find some that’ll be perfect for you. The BOGO offer is just till the end of this week (from today, April 3, 2018, until midnight on Saturday, April 7, 2018) so don’t wait too long. And have fun!